Temple Isaiah is a traditional Reform congregation. We are community dedicated to creating a place for Jewish families looking to fulfill their educational and spiritual needs, nurture their Jewish identity, develop lifelong friendships, and deepen their love for Judaism. Our members are single, married, divorced, and widowed. We are Jews by birth and Jews by Choice. We are LGBTQ and we all have differing abilities. Most importantly, we are warm and welcoming to all who wish to be a part of our community, whether you have lived in the area all your life, have come from a different part of the country, or even the world. Please come and visit and meet our clergy and staff. Temple Isaiah offers a variety of Shabbat experiences on Friday nights and Saturday mornings which are open to all. Join us for Friday night Shabbat services at 8pm or once a month on the fourth Friday of the month at our Family Service, which begins at 7pm. On the second Saturday of each month we have a Tot Shabbat service, and each Shabbat we have Torah Study, led by our Rabbis and Educators. We also have many special services throughout the year to celebrate Jewish holidays and events. 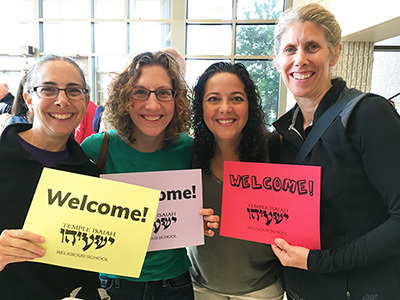 At Temple Isaiah, you have many opportunities to connect with members with similar interests including an active adult choir, junior and senior youth groups, a Men’s Club, Sisterhood, a 50 +/- group, Renaissance (a group for empty-nesters), Mechadeish (a group for widowed and divorced congregants), and many opportunities for social action and community service. Education is at the heart and soul of Temple Isaiah and we offer a full range of programs that start at preschool, continue with the Religious School for grades Kindergarten through 12th. Adult Education classes such as, Torah Study, Scholar-in-Residence programs, Torah on Tap, and adult B’nai Mitzvah training are offered throughout the year. You will find an experienced staff dedicated to working with you and your children. We are welcoming to families and children with special needs and are committed to creating an inclusive environment. Join us for Shabbat or an event that interests you, to meet members and the Rabbi. If you would like more information, we would be happy to send you a membership packet and/or school brochures, email you our newsletter, calendar of upcoming events, and a schedule of services. If you wish to become a member, please download a print form (can be filled in using Adobe Reader) Please send it with your deposit to Temple Isaiah at 12200 Scaggsville Rd. Fulton, MD 20759 Attn: Helen Winoker. We will be in touch with you about the details of membership and the processing of your application. Please don’t hesitate to call or email with any questions.